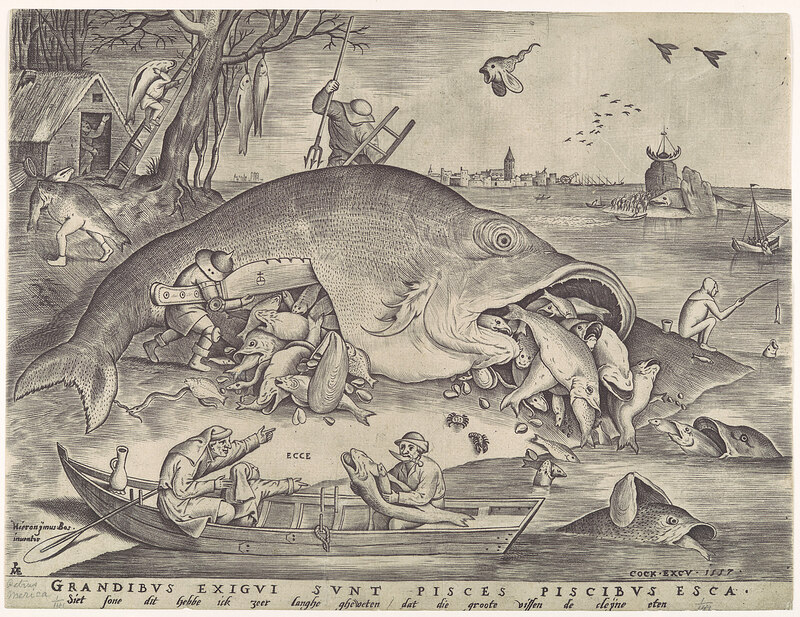 ‘Big Fish Eat Little Fish’ 1557 – Pieter van der Heyden after Pieter Breughel the Elder is, of course, a piece of art that tells a story – a proverbial story. And how vividly it does so! Here is no paper-tray and cellophane-wrapped water-injected boneless white chicken breast for the distanced senses of the diner. This is life full-tilt – the sea thrashes, the men struggle with knives huge and dangerous, small and pointed. The fish flail and scramble, the boats toss. I can smell it. The sea, the innards of fish, the pungent dank liverish smell. The scales fly in the air to land on an exposed cheek, the fingers are numb and cold, slippery with fish. It reminded me, actually, aside from these musings of life – of stuffed squid. The big fish shape sort of looked like a squid, and naturally all those little spouting fishes were the filling – which had to include anchovy as a matter of course. Here’s a recipe for stuffed squid (calamari ripiene). It looks almost exactly like the one I make, except I chop up the anchovies rather than use paste . . . and only three squid to stuff? No. I think they must be larger than the ones I can find. Plus the stuffing/filling needs a generous handful of chopped Italian parsley added to it. Lent is coming up. I wonder if it is as common as it used to be to dine upon fish rather than meat. Certainly the process seems no gentler, after gazing at the image above. One of the great things about Gastronomica is that Darra Goldstein knows a lot about art. What I mean to say is that she knows a lot about Art. The good stuff, the stuff that is capitalized, the stuff that is artlessly artful. Another one of the good things about Gastronomica is that there is a page on the website which features some of the AIF (Artists-In-Food) who grace the pages of the print journal. So right from the virtual page one can browse and click on the artist’s pages and see even more of their work.